Every time we think our culture can't get any more depraved, along comes another story which should make us all think back on the not so distant Nazi Germany holocaust and its evil Dr. Mengele. Thanks to Children of God for Life and Lifesitenews for getting this Frankensteinian story into the news! Pro-life watchdog group, Children of God for Life (CGL), has called upon the public to target the major corporations in a boycott, unless the company ceases to use aborted fetal cell lines in their product testing." 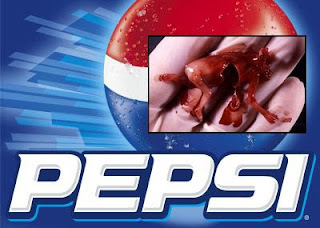 According to COG for Life, President Debi Vinnedge, several food conglomerates have already decided to sever their ties to this horrific practice, but Pepsi has their heels dug in. If your family objects to using aborted fetal cell lines for taste testing, can you do any less than forgo these products, whilst such evil practices remain in effect? To listen to Bob Enyart Live's interview of Debi Vinnedge, go here.